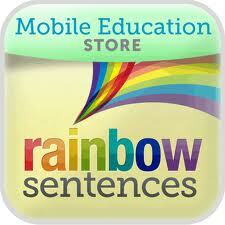 Rainbow sentences was developed by Kyle Tomson who founded the Mobile Education Store which offers a series of excellent educational apps. This app is a great tool to work on reading comprehension and sentence structure as well as verbal expression. Color coded visual cues accompany engaging graphics to help users produce grammatically correct sentences. There are 6 levels of sentence complexity and 165 images from which to create sentences. I find that I can use this with a wide range of clients due to the flexible nature of the app. Creative users can use it to work on written expression, visual scanning and eliciting verbal narrative in addition to reading comprehension and sentence formulation. The user is presented with a colorful picture with text below- which may be color coded or grouped to simplify the task. The text is spoken aloud as it is dragged to the space above the picture to create sentences. Once the sentence is created the user is prompted to record the sentence in their own voice and these recording can be saved or emailed. Successful sentence completion is rewarded with a puzzle piece to encourage continued play and the puzzle comes to life at the end of the level. I have been using this app with students as well as adults. The app costs $7.99. To view a video of the app in action and a demonstration of the various options/settings click here. This entry was posted on Thursday, April 12th, 2012 at 3:02 pm and is filed under Uncategorized. You can follow any responses to this entry through the RSS 2.0 feed. You can leave a response, or trackback from your own site.